We have two Food Truck Festivals planned for 2017. The first festival will be Friday, May 12th (4pm-8pm) and Saturday, May 13th (11am-8pm). The other festival will be later in the year - date TBA. 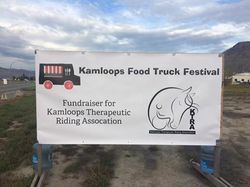 These Food Truck Festivals are KTRA's largest fundraisers for the year - you are helping children and adults with disabilities have opportunities for personal growth through a shared experience with horses just by attending and giving a donation at the entrance! we raised $8,912.60 on entrance donations only. From the bottom of our hearts, thank you! All proceeds raised go towards costs of running our amazing programs and association. There will be line-ups, and they may be long. We have heard your feedback since our first FTF and are doing our best to take everything into consideration and make the appropriate changes as we can. ​Admission: Admission will be by donation, there will be volunteers around to collect them. Look for the green shirts! There will be limited seating as we would like this to resemble as closely as possible to a traditional Food Truck Festival, something more social. Feel bring to bring your own chairs if you'd like though! It's Kamloops, it may be hot - and it may rain. It's best to dress in layers, including a raincoat you can easily wrap around your waist or store in a bag. The essentials for hot weather? A hat, sungless, and SPF of course. Parking will be FREE on airport property - please follow the signs and respect our traffic controllers. We ask that you please do not park in any residential areas, strata's, or houses personal parking spots nearby as local traffic will still need to go to and from those areas. Also, please do not park anywhere along Tranquille per by-law as it is danger to yourself. There will be plenty of parking on-site. We also encourage carpooling to allow a better flow of traffic and less of a wait for all. All proceeds will go to KTRA programs and general maintenance of running the association & grounds. We will be uploading a list of the trucks on this page continually as they sign-up and making constant updates. If you would like to learn more about the trucks, feel free to check any of them out on Facebook by copy & pasting their names! Have a specific question for them? Feel free to message them and they will be happy to help you. This will mainly be a cash only event, although some trucks may have debit or credit options. The airport building also has an ATM on-site that you can visit.